Primitive Saltbox and Willow Tree with Sheep Oval Stack Box with Light Option. 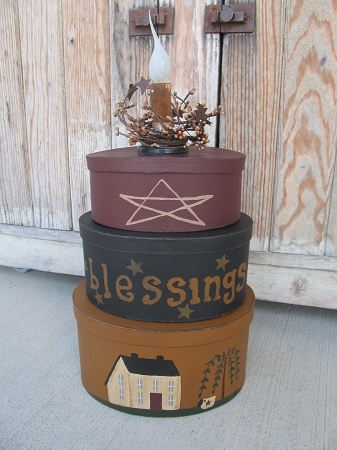 The bottom box is an English mustard color with a cream saltbox house, willow tree and sheep. 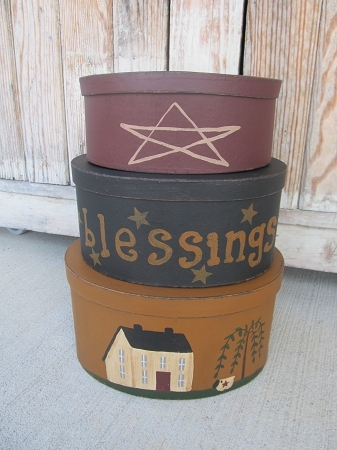 Middle box is painted black with the saying on it surrounded by stars, Blessings is shown, other choices available. Top box is burgundy with a primitive outline of a star. Option to have a primitive candle lamp attached to the top box lid. This option will include the electric candle light, has on/off switch, bulb and tea stained pip berry wreath. The cost for the upgrade is $10.00. This is a great way to add the warm glow of a candle light with primitive stack boxes! I love love love it. This is a great size and makes a nice impact on your decor. Size is 18" with light and 10" wide. 12" high without the light. Hand painted, designed and signed by Heidi.